The Freethought Society continues to demand the right to display a holiday Tree of Knowledge on the grounds of the Chester County Courthouse, alongside Christian, Jewish and Santa displays. 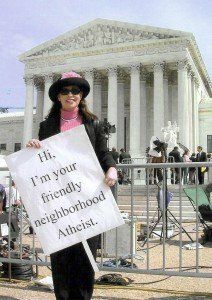 We believe that the non-theist community deserves the same treatment as religious groups when using overnment property. A 2011 display request will very likely be denied, therefore, supporters must be prepared to conduct a “Human Tree of Knowledge” event/protest rally. The event/protest rally schedule will included the distribution of ornaments and participants will be invited to say a few words about how much certain books meant to them. Please plan to participate on Saturday, December 3, 2011 at the Chester County Courthouse located at the corner of High and Market Streets (2 North High Street, West Chester, Pennsylvania). The event will start at 3:00 PM and will include speeches, singing, photo opportunities and a press conference. Please email FS to volunteer (volunteers@FtSociety.org) for one of many jobs that need to be done ahead of time (new ornaments, press releases, media training, etc.). 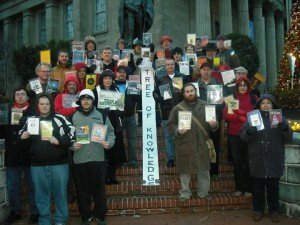 Should the FS petition to include the Tree of Knowledge in the 2011 display be approved, FS supporters will be notified by email, and a notice will be posted on the Freethought Society websites/meetup. An actual tree will be decorated in that case. A 5:30 PM “Dutch-Treat” post-event dinner and get-together will take place at Kildare’s Irish Pub located at 18 West Gay Street, West Chester, Pennsylvania, 19380. The restaurant is located just around the corner from the Chester County Courthouse. For directions to the restaurant call (610)431-0770. To reserve dinner seats, please call the FS office at (610) 793-2737 or email margaret@ftsociety.org by December 1, 2011. PLEASE RSVP via our meetup or Facebook pages.